Every parent cringes when it’s that time in their child’s life to potty train. It doesn’t come at the same time for every child or even every parent. Often times the child is ready but the parent is not or the parent is ready and the child is not. My first attempt to Potty Train Buba was the latter, he just wasn’t ready. It was hard the first time, Missy Moo was tiny, breastfeeding and running around cleaning pee and poo off the floor every five seconds wasn’t easy. So I put it off for a few months, hoping he would be wiser and tell me when he was ready. That was November, and here we are at the end of March. Has four months made a difference? – Stickers and reward chart. – Fun books about going in the potty. 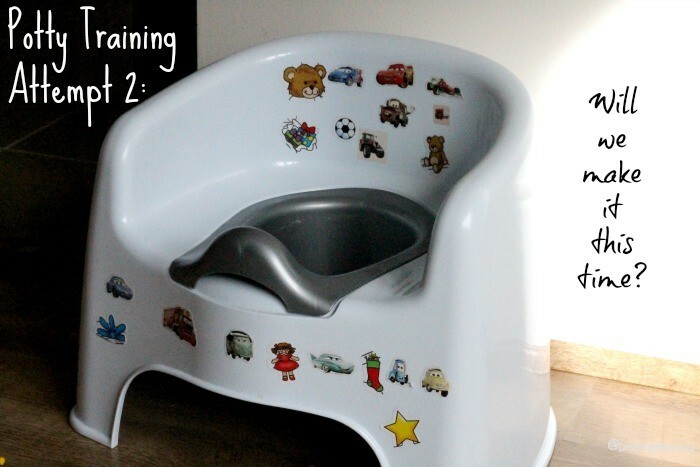 – I let him pick out his big potty, and bought two one for upstairs and downstairs. – I let him pick out his big boy underpants at the store. – Lose sweats and shorts so he can easily pull up and down. – Lots of cleaner, paper towels, and air freshener. – I know a lot of my friends used bribery of chocolate and biscuits. I actually am all for bribery but Buba has severe allergies that prevent this. So I had to get creative. I bought him a Disney Car die cast, and told him it was a special ‘Big Boy Car” and only boys that pee and poo on the potty get this special car. – I even got lucky because on the first day, Special Agent Oso had an episode on potty training where he helped a little boy, funny enough the same name as Buba with blonde curly hair learn how to use the potty. I quickly recorded it and each morning and evening we watch the half hour clip of it. It’s like having a personalized episode of Oso to help us in our potty training process. With all the above, I really think we are prepared and on the right track this time. I think my first mistake in attempt number one was using pull-ups. Pull-ups unlike normal diapers aren’t as absorbent which means Buba got used to feeling wet when he peed in his pull-ups. So when I put big boy pants on him, he kept peeing in them and didn’t tell us he was wet because he was used to the feeling of being wet. So I got rid of pull-ups back in November. On the first day, I left him naked with a t-shirt on so that it was easy for him to run over and go on the potty. I turned the tv off so he wouldn’t get too distracted. I gave him his big boy Disney Car, I bought him and explained that he was now a big boy and this was a big boy toy for boys that pee and poo on the potty. He was so excited that he pulled his diaper off right then and there to get this toy. I explained, this car is special it plays with you if you pee and poo on the potty but if you pee or poo on the floor it goes away. I know some might not agree with this tactic but if you knew my son he will do anything for his cars even learn to use the potty. It’s the same as giving him a piece of chocolate as a reward which I can’t do so I am using his obsession with Disney Cars to do the same. 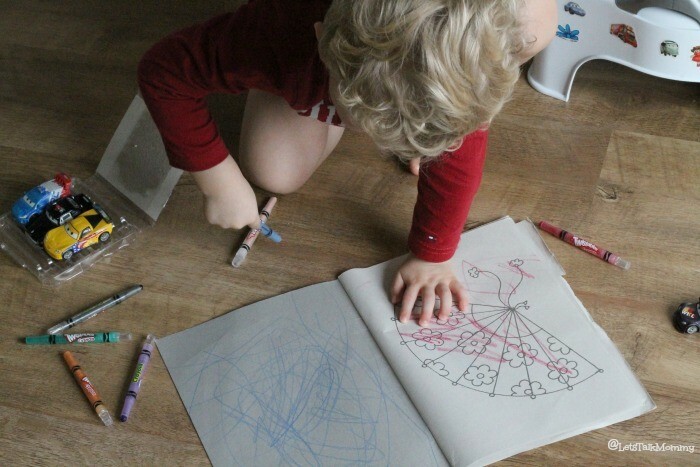 We pulled out coloring books and legos, things we could do right next to his potty so he could quickly jump on it if needed. We had a few accidents which is to be expected on the first day but nothing compared to the first attempt so I was left feeling optimistic. I made sure to not have anything planned all week, to give him plenty of time and less distractions to get the concept. I reminded him every 5 minutes literally, “don’t pee on the floor, we pee in the potty!” I know a weird tactic but it seems to remind him while he played not to just let it flow. I couldn’t just ask him if he needed to go, Buba is a complicated kid when it comes to asking he usually freaks out, screams and hides when I asks him, “do you need to go potty or pee or poo?” Finding a way to tell him to not pee on the floor and ask him where he should pee really worked better for him, just worded differently. I gave him lots to drink so we had plenty of practice running from his toys and activities to the potty. We only had one accident all day and even then he screamed, “pee” so we were getting somewhere. Buba goes to nursery on Thursdays, but I didn’t think he was quite ready for big boy pants and sending a hundred outfits for the day. I told them we had been potty training this week, in hopes they would work with him while he was there. Hoping by the following Thursday he will be ready to come in big boy pants. One more day of naked Buba running around, to make sure he was getting used to the feeling of dry. By day four I didn’t have to remind him quite so much to not pee on the floor and if I asked where does Buba pee or poo he would reply, “in the potty” and point to it. We had friends come visit for a playdate. My test to see if he would have accidents when he was playing with other kids while completely distracted. After apologizing for the naked toddler running around, we enjoyed a playful morning with our friends. Buba had no accidents all day and we had a huge step forward at dinner. While he was eating his dinner, he shouted, “poo, Mommy”. He has never ever said he needed to pee or poo or that he even had peed or pooed in his diaper so this was huge. I ran him over to his potty and he peed. Even though he didn’t poo, he was still recognizing that he had to do something which was great. I thought Buba was doing so good, so we pulled out the big boy pants. I was relieved that he didn’t pee every five minutes like he did the first time we tried big boy pants. He really has been responding well to using his new Disney Car as a bribe and reminding him not to pee on the floor. I also started asking him, “where does Buba pee?” and “where does Buba poo?” Instead of the, do you need to go questions. We now play a game of pointing at various places and asking, “do we potty here? He will reply excitedly, “no, in the potty” and points to it. He loves it. I am attempting to make it fun for both of us. I think this time we might just make it, thanks to Lighting McQueen and Special Agent Oso, who would have thought? Buba even found out that there are Lighting McQueen big boy pants. I have told him if he poos on the potty, we can go buy him some. I suppose it’s blackmail and bribery together. Judge away, but it worked. He hadn’t pooed in two full days since potty training and I was getting worried he was holding it in. When I told him if he pooed on his potty we would get Lighting McQueen big boy pants within an hour he was playing with of course his cars, and all the sudden ran over to his potty and pooed! Without being asked, or put on it by me. This kid doesn’t miss a trick, as soon as he finished he said, “Mommy go to store and buy McQueen pants now!” Damn, I thought I would at least have a day or two as I ordered them online. The two Asdas near us are out of his size so I can’t just go pick some up, eeek. Tomorrow will be the ultimate test as we are going to see our friends’ new baby and visit Granny afterwards. It will be a whole afternoon out, I am going to bring the potty and big boy pants and pray like hell he has picked up a few things the last five days. Wish us all luck! Our friends have four boys and a new little girl so she knows the score. I found the books, the stickers, shopping for a potty and big boy pants didn’t work for us. Buba could care less. Questioning him if he needs to go pee or poo, or even just sitting him on the potty every hour didn’t work for us either. Every kid is different and sometimes you have to think outside the box and find what way your child thinks and what will work for them even if others judge you for it. It was the first time I threw out the Gina Ford books and didn’t follow a potty book routine. For us, reminding Buba not to pee on the floor and rewarding him with a big boy Disney Car toy really is working. My tactic of telling him he loses his big boy car if he pees or poos on the floor only took one or two times telling him and the accidents stopped. It taught him how to hold it. Some might find this mean but this was our way to get Buba to figure out how to hold it. Nothing else seemed to work. Watching his personalized episode of Special Agent Oso helps him know other boys are doing the same as him. It really has helped. He now talks about it more. It is an ongoing process but I am optimistic that we just might make it this time but it’s still early days. Let’s hope Week 2, goes even better when we get back to our routines out of the house. Voting for the finals is now open, would love you to vote for me for Best Baby Blog & Best New Blog! Click the badge below! With awards all in full swing, the BiBs have also opened up. Would love to be considered for Fresh Voice / Social Media. Eeek I am nervous for the car ride. I will keep everyone posted on twitter. lol Fingers crossed. We already had one accident this morning at home! Not a good start. Oh thanks for the advice hun, definitely need to get one of those. Todays are first day out. We shall see. Eeeek agreed least fav of parenting thus far. Mr p avoiding it too. Unfair! How long did it take two weeks? three weeks? months? About to leave already one accident down. Eeek so nervous. I will tweet updates. Praying he doesn’t pee all over my friends house. ahhh There should be a potty training camp we can send our kids to for two weeks all learn together and come back fully trained. Oh I knew I shouldn’t write my post yet. I cursed used. Our day out was fine but today was like we haven’t done anything at all. Nightmare. I think I may have cried once too. Not fun. Oh my word Jenny you’ve been so busy! 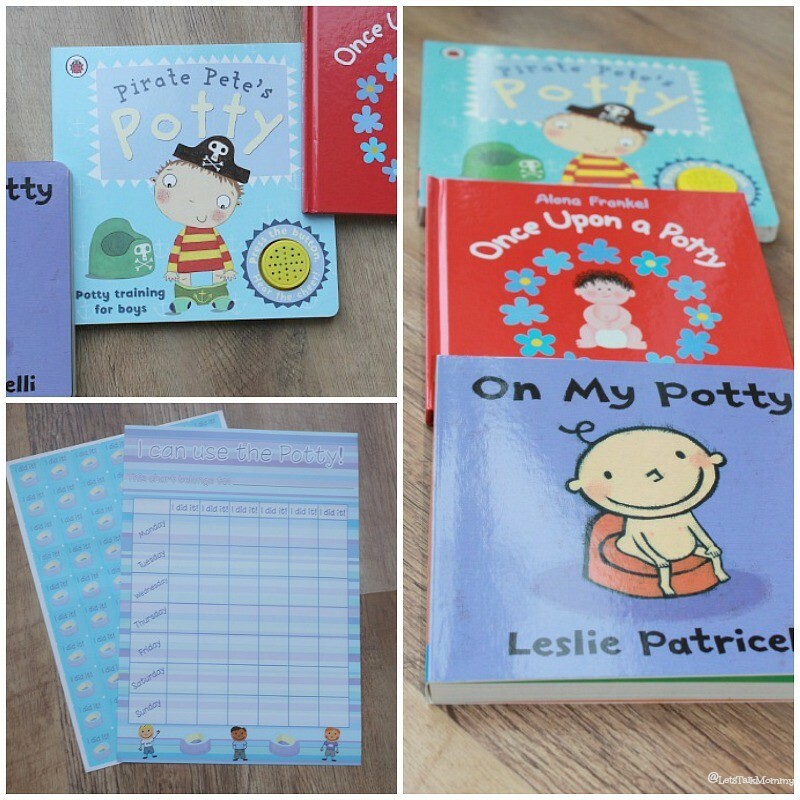 It will be good to look back on these potty training diaries too – wish I’d done it. POD wore her potty as a hat for some time before actually doing anything in it! Great idea with the design, looks far more enticing and best of luck tomorrow, that will be a challenge. 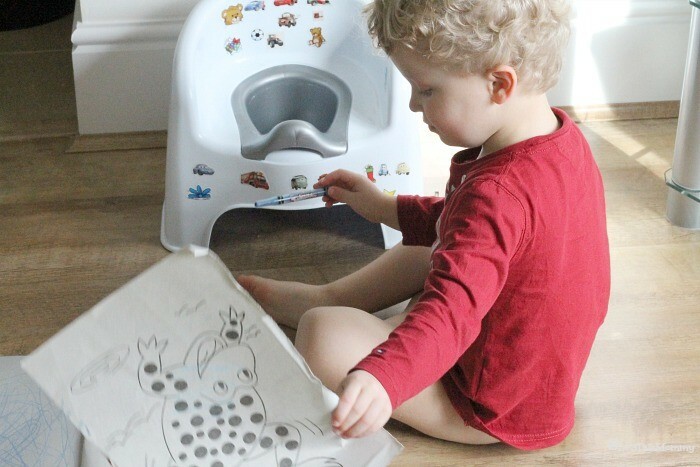 We have a potty in the car that has a lid on it – inspired idea! Thank you for your lovely comment on the blog btw, much appreciated. Well done yourself Mrs, you should be super proud! Thanks charly. Potty training was fine actually yesterday but today wEnt downhill so fast and left me feeling exhausted and guilty for shouting and a bad mommy. It’s been a tough time. Back to square one. Thank you on the congrats. I am still on awe of it all. Can’t believe it. What an honor. Glad we both get to be there. And so excited one of my closest friends in real life is there too butwhymummywhy. Lol it will be a great crowd. Lol best of luck my lovely. Sounds like you have got things under control. Stick with it and I’m sure you will win the potty training. Same here. Buba will hold it until he gets a diaper on at naptime or bedtime then go sometimes. It’s hard the whole process is frustrating. I know a lot of my friends boys do this exact thing. It’s not constipation it’s them holding it in and refusing. Sorry it’s a struggle for u too. At least we are all in this together. Oh I wish I had the latter for sure. Buba had a huge set back and I can’t keep staying in the house and not going to do things just because he won’t wear pants. He is good at home running around naked and then just runs over to his potty and goes. But if he has clothes on he just pees there is no holding it at all. Public is a nightmare especially with a baby in my arms trying to run to the potty and throwing him on it and leaving her on the yucky bathroom floors to fend for herself isn’t ideal. Day 8! eeek I was broken from it all last night. Eeek I hope so, we had a really really bad day on day 7 but today we have hit a great flow of no accidents and actually telling me and running to the potty. May it long continue. Good luck with visiting friend’s new babe and granny. Each day is different we are in full swing of week two and it’s still tough to leave the house. I am hoping there will be a magical turning point soon. I am sick of the sight of my four walls. Thank you. Still a long way to go, we now are on week two and we still can’t leave the house for now. May next week please have a big turn around I am sick of the same four walls. Wow, he’s doing really well. I need a few days of being at home with N so we can try again, but I go spare being stuck at home…feels like such a waste as that’s my free time away from work so I want to be doing things with him not stuck cooped up in the house. We tried stickers, button jars with a dvd for filling it (he’s got one dvd – from purely evening and morning wees, and knows what he needs to do to get another). Maybe I need to try removing toys for every accident there is, although that wouldn’t be able to work at nursery. And he’s 3 so he’d probably just say ‘don’t care’. I’m despairing now, even though he knows what he’s meant to do. He’s now also been saying ‘I’m a baby’ and ‘I want to be a baby’. Arrrggh. That’s kinda of how it’s going here. Poo then wee later. He is getting so much better though. Slowly but surely.